The Lower Modernisms – 028. 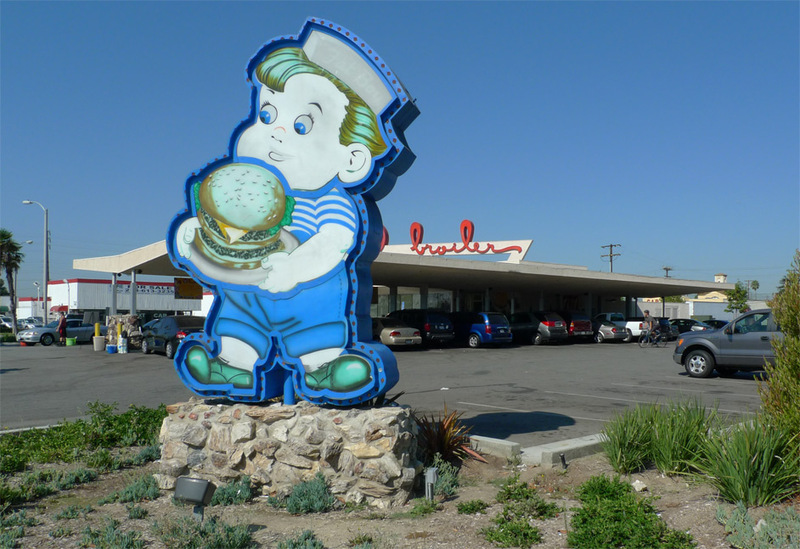 Lomo Featured Project: Bob’s Big Boy Broiler formerly known as Harvey’s Broiler and as Johnie’s Broiler, Downey. 2011 Googie Coffee Shops Bicycle Ride Series, August Ride. 028. 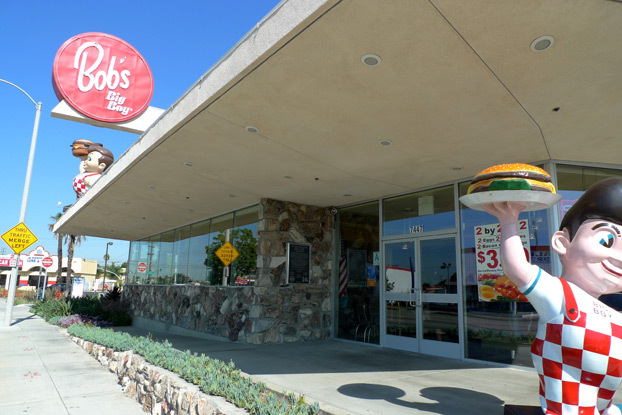 Lomo Featured Project: Bob’s Big Boy Broiler formerly known as Harvey’s Broiler and as Johnie’s Broiler, Downey. 2011 Googie Coffee Shops Bicycle Ride Series, August Ride. September 20, 2011 by James Black. 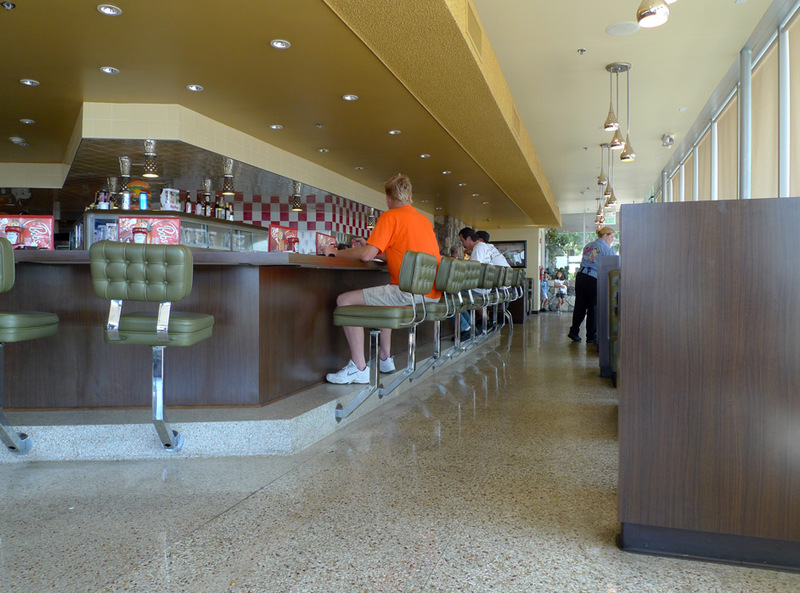 The August installment of the Googie Coffee Shops Bicycle Ride Series paid a visit to Bob’s Big Boy in Downey. This location of Bob’s is both a heritage coffee shop and a brand new one, as it was reborn from the carcass of the mostly and illegally demolished Johnie’s Broiler, originally known as Harvey’s Broiler. After a long, hot ride covering 16 miles each way from the Green, the Riders met special guest Alan Hess, the world’s foremost expert on Googie architecture, who shared breakfast and stories with us at the Broiler. The Broiler, rebuilt quite faithfully to its original 1958 Paul Clayton design, sprawls on its big site in a gentle bend on Firestone Boulevard. An extended roof shelters a carhop service area. The spaciousness of its parking lots afforded the Broiler’s role as a center for car culture and “cruising,” a time-worn practice illustrated in nostalgic movies. The importance of the automobile in its design is manifest also in its signage – the great extant “broiler” in script with the up-jutting loops of its “b” and “l” symmetrical so that the sign works from both sides, the loops vaguely reminiscent of the stylized wheels of a cartoon hot-rod. At just the right location in Firestone Boulevard’s curve, the sign is visible to westbound traffic from way off; as Alan Hess described the sign in Googie Redux, “the design creates an indisputably twentieth-century gateway that echoes the portals of medieval towns” (103). The Broiler is now festooned instead with familiar Bob’s Big Boys, but Bob’s has proven a great custodian for the heritage of this coffee shop, taking on the project of rebuilding it and largely maintaining the character that made the Broiler popular in the first place. 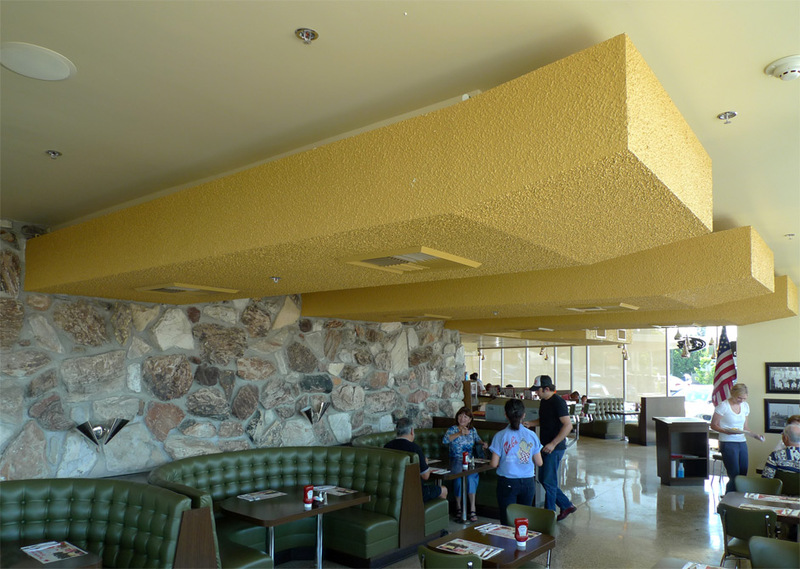 The front exterior consists entirely of either rough rock wall or lightweight glazing, engaging in the textbook Googie contrasting of shelter and exposure. The interior is great. Light and airy, it would make a fine coffee shop irrespective of the many Googie niceties like terrazzo floors and cantilevered barstools. Facing the parking lot to the east, the organization of the Broiler follows the standard Armét & Davis diagram with counter on one side and banquettes next to the window; instead of the sloping planes typically used by Armét & Davis, Clayton designed stepped soffits that achieve a similar affect. Each tier of the soffit has a different style of lighting, and the intermediate soffit keeps the ceiling neat and orderly by enclosing the mechanical ventilation system and providing supply air horizontally from registers in the side of the soffit. In the generously proportioned dining room facing Firestone Boulevard to the south, semicircular booths and larger tables serve the needs of customers in need of hanging out. The room is bound on one side by rock wall and on the other by full-height storefront glazing, but the ceiling steals the show. The soffits, giant like dinosaur ribs on The Flintstones, seem to project out from the rock wall, tapered elegantly at their opposite end before they reach the storefront window. They are painted a contrasting golden hue and held below the ceiling with a reveal to create a shadowline so that they are expressed as elements distinct from the ceiling plane. The spacing of the soffits is coordinated with the booths and the wall sconces, and of course these soffits again serve to conceal the ventilation system, an important consideration on a building detailed so as to express a thin, flat roofline when viewed from outside. The rock wall continues past the edge of the storefront glazing out to the west, dematerializing the glass and emphasizing the continuity between the interior and exterior space. The banquette runs the full extent below the window. 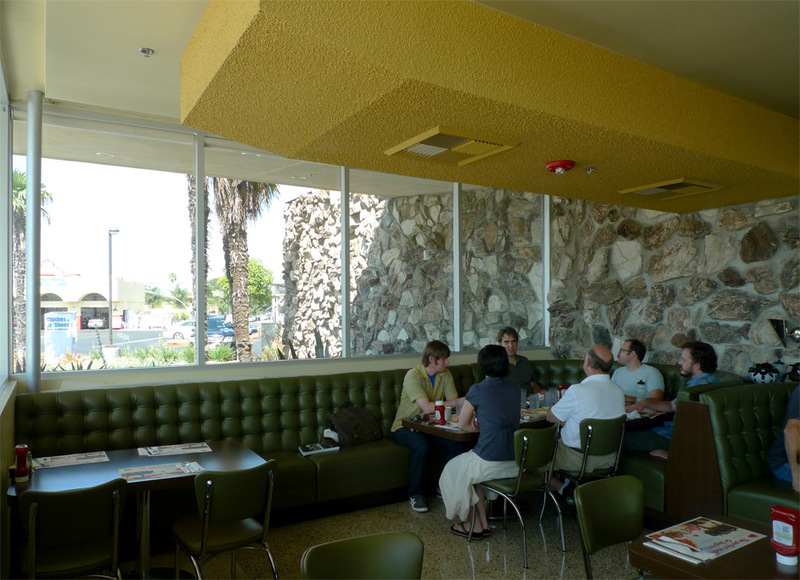 In the tempered daylight, here in the best corner of a most perfect coffee shop, Alan Hess told us stories of 1960s Downey, its car culture as recorded in Tom Wolfe’s “The Hair Boys,” the rise and fall of Harvey’s Broiler and its phoenix-like rebirth as a Bob’s Big Boy. I feel privileged to have taken part in this experience. Wow! Really cool write up and some nice photos to go with it. Thanks, George. May Downey stay awesome! OMG I’m sooooo happy they rebuilt this iconic location!!!! I thoroughly enjoyed the article, and am always so happy to know that more and more people are appreciating the Broiler! Thank you for retelling the now-famous story of Harvey’s/Johnie’s/Bob’s, meeting with Alan, and keeping the dream alive! I’ll share this on our website and Facebook page. Great, Adriene! Thanks for visiting the Lower Modernisms!